The Outstanding Graduate Teaching Assistant Award is designed to recognize and reward graduate assistants for outstanding performance in teaching and instruction. Two awards will be given annually - one to a doctoral student and one to a master's student. The recipients will receive a cash award of $500 in recognition of exceptional effort and contributions to academic excellence through teaching and instruction. Evidence of effectiveness in instruction, including mastery of teaching techniques and consideration of student needs, interests and problems, including accessibility to students outside the classroom. Knowledge of subject matter evidenced by student evaluations, reviews by supervising faculty, peer review and/or departmental recognition awards. Concern with intellectual growth evidenced by student’s own academic achievement and self-development. The nomination must bear the signatures of the teaching assistant's immediate supervisor, department chair, graduate program director (if different), and the College or School dean. Description of course or courses taught as a graduate teaching assistant, including your primary responsibilities for each course. Please identify the faculty supervisor for each of the courses listed (if applicable). Description of your teaching methods and general approach to teaching. Include any tools or techniques that you feel are particularly helpful to students. You may also comment on any of the three criteria for nomination by the academic unit, listed above. If you are a doctoral-level student, you must additionally provide all of your teaching evaluations. Please submit only what is requested above. Additional material will not be forwarded to the committee. Nomination materials must be received by the Graduate School no later than Friday, August 31, 2018 at 4:30 p.m. Materials can be emailed to graduateschool@siue.edu. 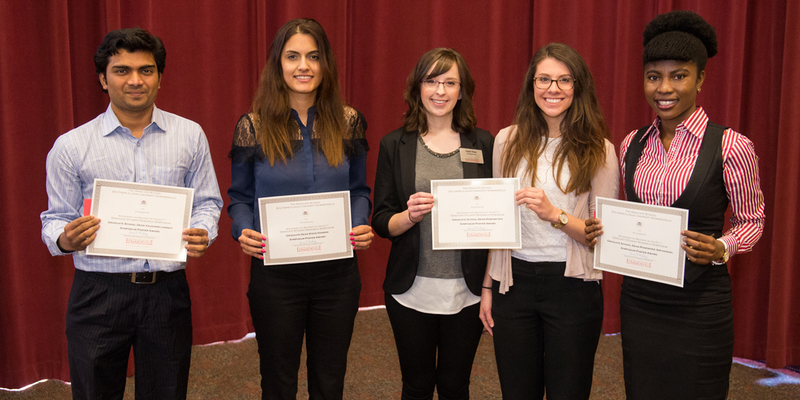 Nominations will be reviewed by the Graduate Student Award Committee, and the award will be presented at the Graduate School's Fall Graduate Awards Reception.